The bouncing blade guys 'truth extractors' are a lot of fun with projectile weakeness and appropriate supports, especially for indoor maps where they can hit the same mob multiple times with the same blade. 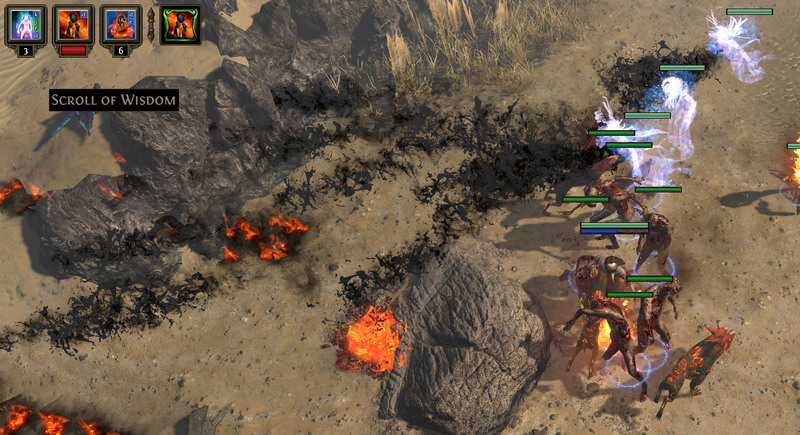 Infact the map verisons seem to have more powerful/larger AOE on thei firestorm thing. I have a 4 link Vis mortis setup - Spectre + minion damage + spell echo + GMP. tried 2 of those SRS summoning spectres, they seem better than in Harbinger, had Hatred aura. Answering myself, it seems that its Wraith from A7 Crypt. Does the added crit from ice golem affect the frost sentinel's freezing rate? I am doing a Flame Golem build. I was planning to have 2 Spectres as OFFENSIVE support to the golems. What would you suggest guys? I also need them to be tanky, don't want to resummon them all the time. I know there are some Carnage Chieftain monkey and I tried them a bit, but they seem to be rarely using their ability. Are there some with auras and such? Join the discussion if you are also tired of seeing flame / elemental spectres as the only viable way for this game. Topic: Ele damage vs phys / chaos. What supports are you using? Is there any where I can look up spectre's life numbers? PoB indicates that my lv84 spectres (picked fire-eater which has similar life% to tukohama's) only have 25k-ish life while my Anime Guardian has about 40k. The numbers are apparently wrong, according to how their survivability looks like in real game.